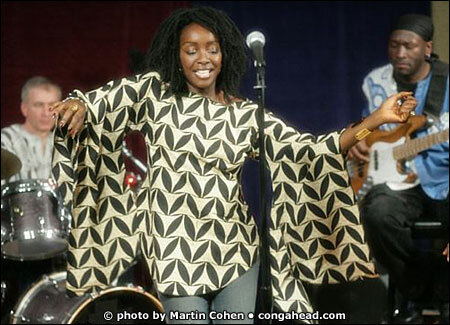 On April 11, 2005 Kaïssa visited LP's studio for the first African performance the company has done. Virtuoso percussionist, Samuel Torres was chosen for this project as he is experienced in doing the music from Cameroon, Kaïssa's native country. The tune they performed was one she wrote with her husband and band's drummer and musicial director, Maciek Schejbal. The band was the most international to ever record at LP®. Vocalist Kaïssa is from Cameroon; drummer, Maciek from Poland; bassist Francky Moulet from Congo; guitarist, Fred Doumbe from Cameroon; vocalist, Nicole Williams from Jamaica and percussionist, Samuel Torres from Colombia. Samuel Torres performed on the new, 14" djembe along with Udu drum, Giovanni Palladium congas, One Shot shakers and various bells, blocks, chimes and toys.